Professor Tam received his medical degree from University of Cambridge. He joined the former Royal Postgraduate Medical School and obtained his PhD in studying the role of cytokines in glomerulonephritis. His research training was supported by a Medical Research Council Training Fellowship and a National Kidney Research Fund (now Kidney Research UK) Senior Fellowship. He has been investigating the importance of cytokines in pathogenesis of glomerulonephritis, diabetic nephropathy and renal allograft rejection. His research group has developed experimental therapies of glomerulonephritis using soluble cytokine receptor, receptor antagonist and monoclonal antibodies, recombinant regulatory cytokines and signal transduction inhibitors. He has also applied the experience from cytokine analysis and proteomics to development of non-invasive biomarkers for glomerulonephritis, for diabetic nephropathy and for complications in peritoneal dialysis patients (in collaboration with Professor Edwina Brown). Together with Professor David Taube and the Transplantation Translational Research Group, he is investigating the novel mechanisms of renal transplant rejection and developing novel anti-rejection therapy. The expertise of his research group has been applied in the preclinical and early clinical development of anti-inflammatory therapies, in collaboration with the industry. Professor Tam is the Principal Investigator of an international randomised controlled clinical trial of a Spleen Tyrosine Kinase (Syk) inhibitor in the treatment of IgA nephropathy. 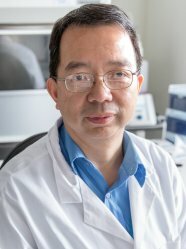 (https://clinicaltrials.gov/ct2/show/NCT02112838, http://www.hra.nhs.uk/news/research-summaries/phase-2-study-of-fostamatinib-for-subjects-with-iga-nephropathy) He is also the Founding Lead of the UK Rare Disease Group for Retroperitoneal Fibrosis (http://rarerenal.org/rare-disease-groups/retroperitoneal-fibrosis-rdg/). Together with Professor Robert Unwin (Royal Free Hospital, University College London), he has established the Purinergic Receptor Research Consortium in order to investigate the novel function of purinergic receptors in regulating inflammasome and cytokine secretions in renal diseases. Together with Dr. Andrew Frankel, they have established the Diabetic Nephropathy Translational Research Consortium to investigate novel disease mechanisms and to develop new therapy.